Here are 10 reasons that help explain why that is, from a customer’s perspective. A travel agent’s job is on the line with every trip. Travel agents have a boss to answer to—or they are the boss—and they are a real person clients can speak with to works things out. Travel agents have been doing the job for years and know all the ins and outs. Traveling to Europe for the first time? Instead of deciding where to go based on anonymous comments on a website, speak to someone who does this for a living and knows what they’re talking about. When booking an expensive trip, you want to see everything and experience the best a city has to offer. A travel agent can ensure that your dollars go a long way—and make sure you don’t miss that amazing restaurant down the street, or the special event going on the day you will be in town. A travel agent knows where to go and when. While some people enjoy “just winging it,” a travel agent can give a clear-cut schedule of what will be happening on a day-to-day basis, and keep clear records of everything that is included in the trip. A travel agent can help map out exactly how much a trip will cost, so there are no surprises. Does that excursion on Monday include lunch, for example, or do you have to buy your own? Does it pay to take the drinks package on the cruise ship, or pay for the excursions in advance? 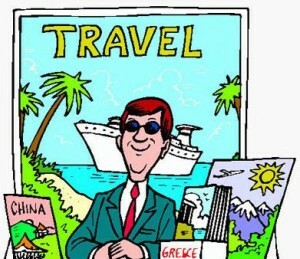 A travel agent can guide you and save you money. Things happen. A travel agent can offer insurance in a number of ways, from guaranteeing that your hotel is safe and the company running the excursion won’t rob you, to actually advising on which insurance policies you need, from trip cancellation to medical emergencies. They also insure that you have the correct travel documents, so you don’t end up missing your plane or cruise. And when things do go wrong, travel agents have the resources and the contacts to get you to the head of the line. Let’s face it, we all want to be a little bit different. A travel agent knows the new destinations and the new places in them —and often they can get you in. Through their partners, they also often get freebies for their customers that range from a free drink to an exclusive admission to a hot event. Spending hours and weeks researching the perfect trip can take up a ton of time during a busy work week. A travel agent will spend a little time getting to know you and what you are looking for, and then put together an entire vacation customized for you. Can’t book a room at a place you really want? Had a last minute addition to a trip but all the rooms are booked? No problem. Travel agents spend years developing long-term relationships, and travel companies understand how important their repeat business is. Travel agents have leverage with most hotel companies and resorts, and they are more likely to get what they want than a single consumer. In short, if you have never visited a travel agent, you are missing out on a chance to save time and hassles and aggravation—and often, money as well. Call now for for reservations and information.